The news broke yesterday that the director of the Gaza branch of World Vision, Mohammed El-Halabi, was arrested by the Israeli internal secret service for allegedly diverting tens of millions of dollars of World Vision funds to the terrorist arm of Hamas. It is reported that during the investigation El-Halabi admitted that he had been a member of Hamas since his youth, had undergone military training and had been commissioned by Hamas to infiltrate World Vision. He also reportedly admitted that his father, Halil El-Halabi, who had served as head of UNWRA’s educational institutions in the Gaza Strip for years, was a member of Hamas and used his position as a UN employee to help the terrorist organization. El-Halabi allegedly employed a sophisticated and systematic apparatus for transferring 60% of World Vision’s annual budget for Gaza to Hamas – approximately US$7.2 million per year. This included establishing and promoting fictitious humanitarian projects and fake agricultural associations which acted as cover for the transfer of monies to Hamas. It is alleged the funds diverted to Hamas were utilised to finance the digging of terror tunnels, the building of military bases and the purchase of weapons. Some of the money also went to pay the salaries of Hamas terrorists and, in some cases, senior Hamas terrorists took large sums of money for their own personal use. El-Halabi is also charged with regularly transferring equipment that he ordered on behalf of World Vision, supposedly for agricultural aid, to Hamas for construction of military outposts and to dig terror tunnels. Also, Germany’s Federal Ministry for Economic Cooperation and Development has reportedly said it had indefinitely put on ice payments to the Christian charity totalling €1.5m (US$1.66m). The New Zealand government has given more than $7m in grants to World Vision over the past two years. There has been no statement from any New Zealand officials at the time of publishing about whether this support will continue or not in light of the allegations. World Vision is one of New Zealand’s most popular aid organisations with $54m worth of donations annually designated for ‘overseas programmes’ according to recent accounts. The organisation has used a sponsor-a-child fund-raising model for five decades, playing on the power of personalisation, even though most of the money does not go directly to the child or the child’s family. World Vision also engages high profile media personalities, such as, in New Zealand, TV3’s Mike McRoberts, to champion its cause. McRoberts worked with El-Halabi in Gaza (see the header image of this article). World Vision has made statements that it “stands by Mohammad [El-Halabi], who is a widely respected and well regarded humanitarian, field manager and trusted colleague of over a decade” and “we have no reason to believe the allegations are true” based on the available information. They have also stressed that there was no suggestion the organisation had been complicit in any diversion of funds. New Zealander Alex Snary who was National Director of World Vision in Jerusalem, West Bank and Gaza and has been closely associated with El-Halabi posted a message of support on his facebook page stating, ‘He is simply one of the finest leaders I have had the honour to work with’. However, serious questions must be raised in light of El-Halabi’s admission and World Vision’s concerning history of anti-Israel bias. Since 2012 the Tel Aviv based civil rights centre, Shurat Hadin has warned that funds provided to Gaza by World Vision were being utilised for terrorism. If this is so, a disturbing implication is that World Vision may have inadvertently helped to fund the terrible 2014 Gaza war. Why were these warnings not heeded? World Vision has been criticised in the past for its anti-Israel bias. Staffers and leaders of the organisation have routinely used an anti-Israel narrative to raise funds and generate publicity for World Vision’s work, blaming Israel for the suffering of Palestinian children, yet saying almost nothing about the role Palestinian elites play in causing this suffering. No mention is made of summer camps where youths are taught to hate Jews or the use of child labour to construct tunnels into Israel from Gaza. Virtually every article highlighted by World Vision staffers on Facebook and Twitter is a condemnation of Israel; few, if any, highlight Hamas’ extremism in the Gaza Strip and the corruption of the Palestinian Authority in the West Bank. In 2011 World Vision, along with aid organisation Tear Fund sponsored the touring of the film ‘With God on our Side’ throughout New Zealand. This film claimed to be providing a “missing narrative” of the Middle East conflict, but instead provided an error-strewn, biased and simplistic view of the situation. The Simon Wiesenthal Centre described it as containing “monstrous distortions” and “making a strong emotional argument built on lies”. Also of concern is the relationship between World Vision and news outlets which could be perceived to undermine journalistic objectivity. The practice of co-sponsoring the production of news segments has been going on since the 1980s. World Vision’s role in criticising only one party to the conflict and downplaying (if not ignoring) the role of oppressive and corrupt Palestinian leaders became particularly evident during the fighting between Israel and Hamas in the summer of 2014. 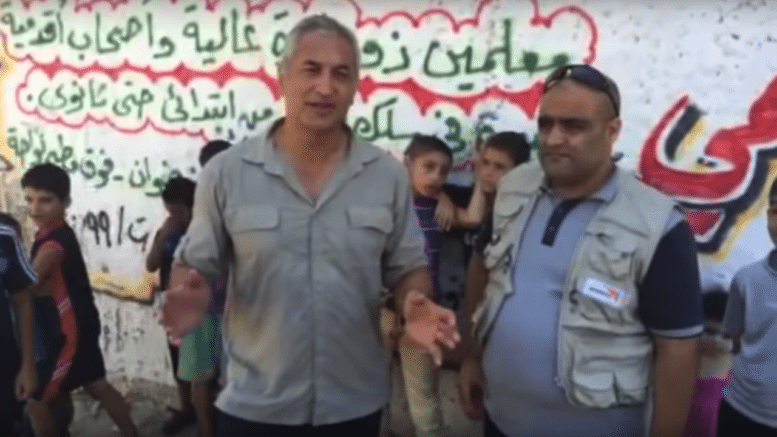 In New Zealand, TV3’s Mike McRoberts produced a video in Gaza about the situation there, in co-operation with World Vision, which lacked context and balance. The video highlighted the suffering of children and other Palestinians whilst strongly implying that Israel was targeting civilians and completely responsible for the conflict. It ignored the fact that Israel made strenuous efforts to minimise casualties, while Hamas failed to protect civilians including children, even using them as human shields. Dark shadows are now cast over how World Vision uses donor funds. In whose pocket do they end up? Until these questions can be answered satisfactorily, fair-minded New Zealanders should think carefully about supporting an organisation with a history of anti-Israel bias and an unwillingness to investigate allegations of misuse of funds, an NGO that, under cover of its purported humanitarian objectives and Christian principles, insidiously pushes a one-sided political agenda. The possibility that Kiwis might have, in good faith, given money for humanitarian purposes that has instead aided and abetted a terrorist organisation and been used to create more misery, is very troubling indeed.